Teenager Jake Portman (Butterfield) is very close to his grandfather, Abe (Stamp), who tells him stories of when he was a boy and lived on an island off the coast of Wales during the Second World War. Abe lived at Miss Peregrine’s Home for Peculiar Children, a place where children with paranormal abilities could live freely and without fear of persecution. In time, Abe had to leave, but he’s never forgotten his time there, and he’s told Jake many stories during the course of Jake’s growing up, but Jake has always believed them to be Abe’s version of fairy stories. 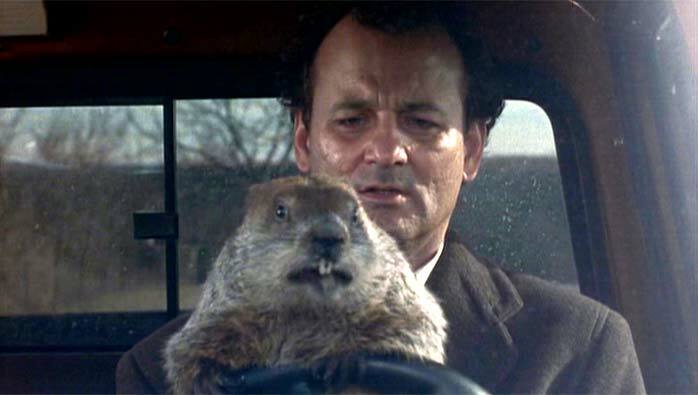 But one day, Jake finds his grandfather’s body in the woods near Abe’s home; he’s been attacked and his eyes removed. With his last breath, Abe exhorts Jake to find “the bird, the loop and September 3, 1943”. The discovery of a letter from Miss Peregrine to Abe, added to advice given by Jake’s therapist (Janney), sees Jake and his dad, Franklin (O’Dowd), heading for Wales. They stay at the local inn, and soon, Jake is searching for the “peculiar” home. He finds it in ruins, the result of a direct hit by a German bomb on September 3, 1943. But while he marvels at confrmation of the home’s existence, several of the children Abe has told him about, make themselves known and draw Jake into their world. They travel through a “loop”, a part of time that has been folded in on itself and now re-plays the same day over and over: September 3, 1943. And Jake meets Miss Peregrine (Green) herself, the children’s guardian, called an Ymbryne, a bird able to take human form (and vice versa) and manipulate time. When author Ransom Riggs’ novel, Miss Peregrine’s Home for Peculiar Children was first published in 2011, it was an unexpected success. Riggs’ tale of peculiar children with strange abilities and the evil creatures that hunt them was the first in a trilogy of novels that breathed new life into gothic fantasy. 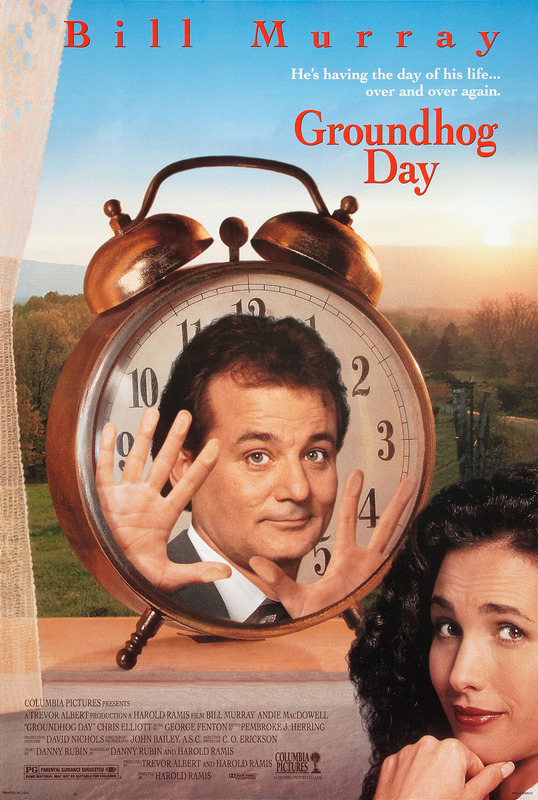 It was obvious that a movie version would be made, and who better to bring the novel to life than Tim Burton? 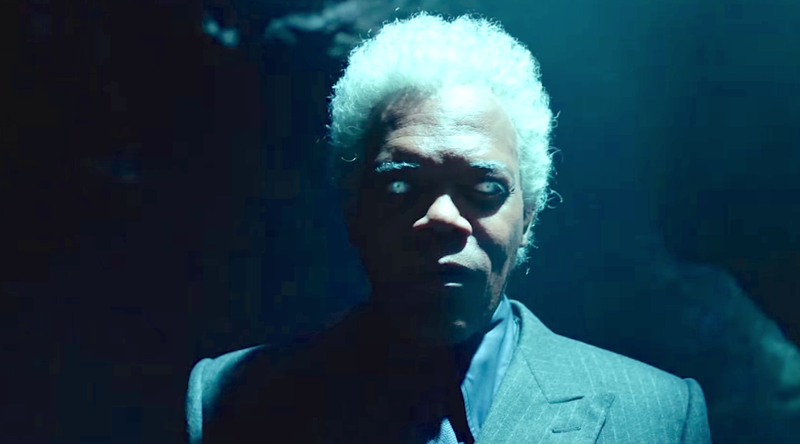 His brand of weird humour and his visual stylings were perfect for Miss Peregrine…, and with a script courtesy of Jane Goldman (X-Men: Days of Future Past, Kingsman: The Secret Service), all the signs were good that the movie would be as dark and strange and captivating and exciting as the novel. And for the most part it is. Ultimately, it’s the adaptation that doesn’t work entirely, with Goldman unable to pin down the main storyline, and fumbling with the subtext relating to humans as monsters during World War II (it’s no coincidence that Abe is a Polish Jew and a survivor of the ghetto, and that the hollowgasts’ name sounds like something else from World War II). With the main ingredients of Riggs’ tale broadened at first and then allowed to carry on broadening, the movie ends up being only half as rewarding as it could have been. Things begin well with Stamp’s genial yet firm Abe trying to keep Jake safe from the threat of the Wights and the Hollowgasts, but once Abe dies there’s an uneasy switch from Abe and Jake to Jake and Franklin, and their trip to Wales. Goldman rushes things along and soon Jake is getting to know the likes of Emma Bloom (Purnell), who is lighter than air and has to be weighted down; Millard Nullings (King), an invisible boy; and Olive Abroholos Elephanta (McCrostie) who can set things alight just by touching them. It’s this stretch of the movie that is the most enjoyable, as Jake (and the viewer) gets to know everyone, and the idyllic, if repetitive, nature of the children’s existence is explored. There are terrific performances from all the child actors playing the Peculiar Children of the title, and a wonderful performance from Green as their guardian. With her probing stare and knowing smiles, Green is the movie’s ace in the hole, and the movie misses her energy whenever she’s off screen. Once things start to unravel and Mr. Barron gains the upper hand, the movie pauses to regroup itself, and heads for a crowd-pleasing finale at the end of Blackpool Pier that involves a riotous showdown between Hollowgasts and animated skeletons á la Jason and the Argonauts (1963). Along the way it abandons any notion of cohesion and continuity, and its attempts to make sense of the time loop/time travel conundrum the Peculiars and Jake find themselves in are brief and inconclusive (and baffling to anyone not paying full attention). But while the script tries to work out how best to tell the story, and in doing so deviates from Riggs’ original halfway cliffhanger-ish ending, the movie is rescued by Burton and his striking visual compositions and the movie’s darkly exuberant set design and decoration. This is, at times, a sumptuous movie to watch, and Burton’s trademark gothic flair is well in evidence as he guides the viewer through a series of imaginative and impressive sequences that more than adequately show how good a fit for the material he is. But again, when the story has to take centre stage it’s often weak and lacking focus, though to be fair to Goldman she is trying to cram an awful lot into a two hour movie, and as good as she is as a screenwriter, when the source material is as detailed as it is, it’s unsurprising that some of the good stuff is going to be overlooked or a way for it all to fit in isn’t explored with any vigour. Alongside Burton’s efforts, those of Green, Jackson, Stamp and Purnell are most welcome, with Jackson’s pantomime performance proving weirdly appropriate. Fans of the novel will be surprised to find that this is, unless a sequel is green-lit, a stand-alone movie with only a couple of nods to the book’s original ending. Does this work? The answer is impenetrable, either way. Fans and supporters of the novels will be disappointed that this isn’t the beginning of a series, and newcomers will most likely have wanted to spend more time getting to know all the peculiar’s; all in all, there’s something for everyone, just not as much for avid fans of the book. 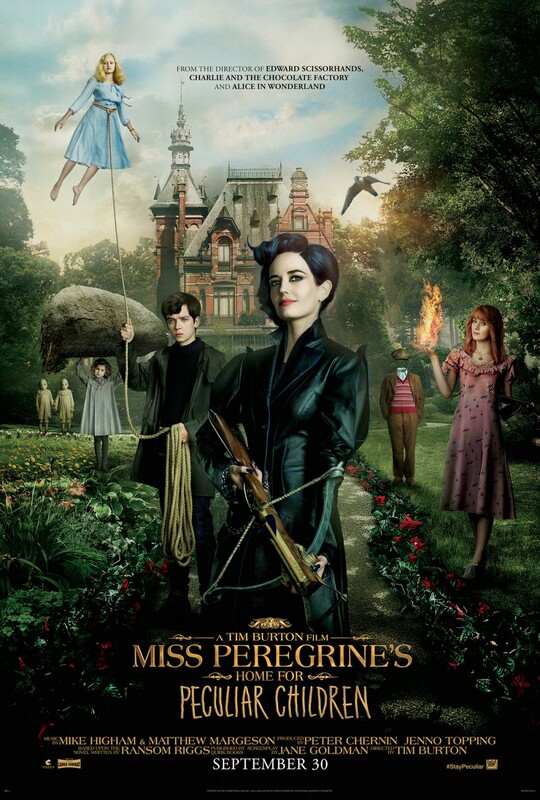 Rating: 7/10 – with its script proving too wayward, and feeling like it was rushed (or hastily rewritten at some point prior to filming), Miss Peregrine’s Home for Peculiar Children entertains in fits and starts; and yet it’s hugely enjoyable when Goldman and Burton’s sensibilities meet in the middle, and there’s more than enough on display to justify the movie’s being seen by as many people as possible, so perhaps this is one adaptation where advance knowledge of the plot isn’t necessary… or desirable. 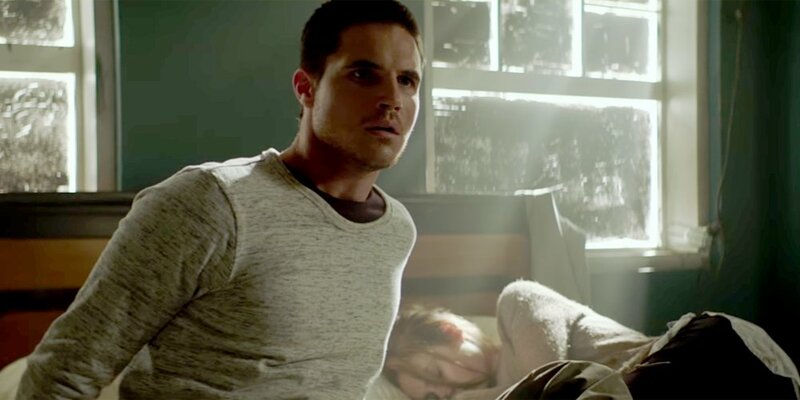 In the future, a man (Amell) wakes with a start. It’s early in the morning and there’s a woman (Taylor) sleeping next to him. Suddenly, men wearing air filtration masks burst in; when the man resists them he’s rendered unconscious. When he wakes for the second time, he and the woman are tied to chairs in the basement. The men are threatening, but will leave if the man gives them his “scrips”, credit notes they believe he has a large supply of. The home invaders leave the couple to think about it. The man finds a way to free himself and the woman. The man attempts to escape and is killed in the process. In the future, the man (whose name is Renton) wakes with a start. It’s early in the morning and there’s a woman (whose name is Hannah) sleeping next to him. Suddenly, men wearing air filtration masks burst in; when Renton resists them he’s rendered unconscious. When he wakes for the second (fourth?) time, he and Hannah are tied to chairs in the basement. The men are threatening, but will leave if the man gives them his “scrips”, credit notes they believe he has a large supply of. The home invaders leave the couple to think about it. The man finds a way to free himself and the woman. Aware that, somehow, this has already happened, he forms a plan to kill the intruders by releasing cyanide gas into the ventilation system. While he turns on the system, he waits for Hannah to release the gas. But she doesn’t, and is revealed to be in collusion with the men. Renton hands over the scrips but is then shot and killed. Renton wakes with a start. It’s early in the morning… and his predicament is beginning all over again. He formulates another approach but this backfires as well, and so on, until one by one, Hannah and the intruders become aware that they’re all stuck in a time loop, one that lasts for around three hours and fourteen minutes, endlessly repeating itself. The cause is a device, the ARQ (pronounced Ark), that Renton was working on for the Torus Corporation, and which he stole from them when he realised that its properties as a perpetual motion machine could be used as a weapon. The intruders, and Hannah, are members of a rebel group called The Bloc, and Renton is convinced that they’re after the ARQ and the need for scrips is incidental. Not wanting to let either side get their hands on the ARQ, Renton tries to figure out a way of escaping the time loop, saving himself and Hannah, and foiling the plans of the Torus Corporation and the Bloc. 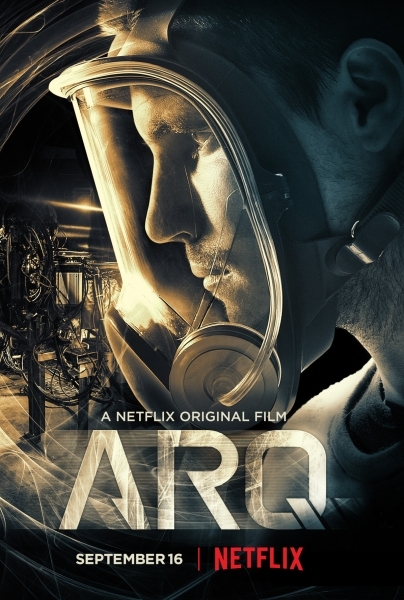 Writer/director Tony Elliott’s first feature, ARQ is a quirky, sincere sci-fi drama that is refreshingly free of the kind of initial setting up period that would normally introduce us to the characters and their surroundings before letting them loose in the overall plot. 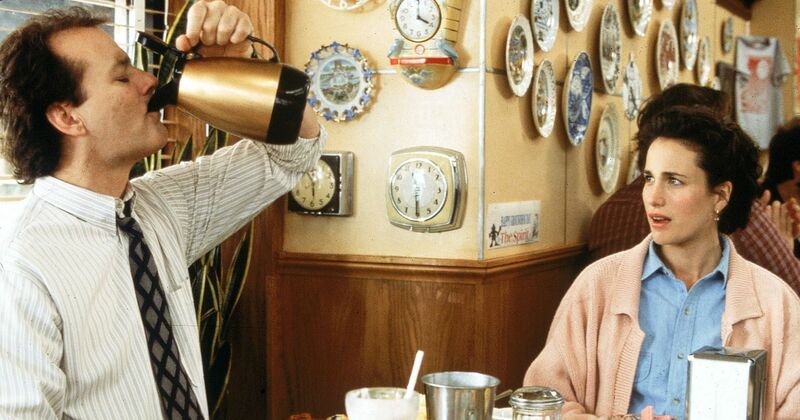 Instead, Elliott throws us and Renton straight into the thick of things, and with a great deal of aplomb, lures his main character, and the viewer, into thinking that a solution to the time loop can be easily arrived at – and despite our knowing that nothing that easy is likely to happen; this is a time paradox movie after all. With each successive loop, the movie creates more and more unexpected twists and turns, and in doing so, proves remarkably refreshing to watch. Of course, things get increasingly worse with every loop, and there’s an awful lot of dying involved (mostly by Renton), but Elliott’s script retains a fair degree of optimism as Renton’s efforts to solve the problem of the time loop and the ARQ’s role in it gathers momentum and urgency. The necessary internal logic that keeps everything as credible as possible is strictly maintained – for the most part – and one huge flaw aside, keeps the viewer hooked and wanting to see what happens next (the flaw involves the ARQ and what’s needed to shut it down). As Renton’s dilemma becomes more acute – can he afford for even the Bloc, the nominal good guys in this story, to have the ARQ? – Elliott works hard to maintain a level of suspense that also allows the relationship between Renton and Hannah to be explored in some detail. Their back story allows for a degree of ethical debate, but thankfully it’s not at the expense of the movie’s more acute thriller elements. But it does add some much needed emotional depth to what would otherwise be a straighforward sci-fi thriller. 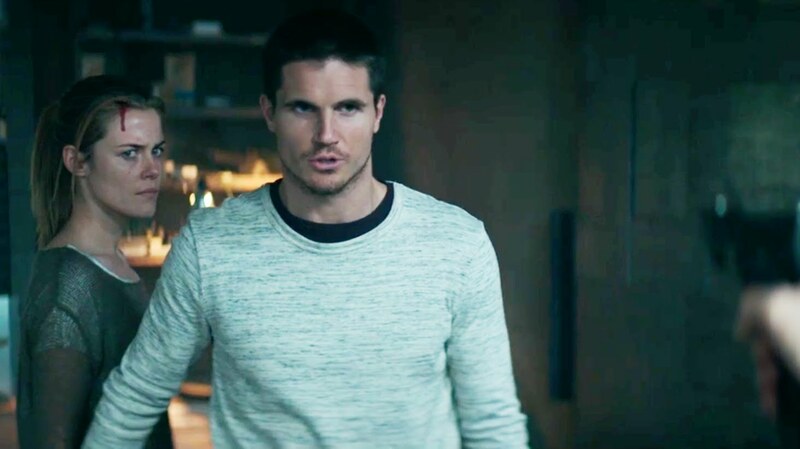 Both Amell (best known for roles in TV shows such as The Flash and The Tomorrow People) and Taylor (also a TV alumni from shows such as 666 Park Avenue and Jessica Jones) strive for an honesty and a sincerity in their roles, and while they both stumble occasionally thanks to minor inconsistencies in Elliott’s script, their commitment to the material is evident in every scene and every twist and turn of the narrative. The story plays out in a claustrophobic home setting, with a splendid mix of futuristic and old-fashioned production design courtesy of Oleg M. Savytski that makes Renton’s home look entirely practical for his needs and not just the script’s. If occasionally it feels like it’s a home designed to replicate a warren, with too many corridors and rooms for comfort, it merely adds to the level of anxiety created by the recurring time loop and the feeling that there’s no escape. Even when Elliott allows Renton and Hannah a brief respite by letting them go outside, they’re too uncomfortable with the open space (and a further mystery) to stay there. They return inside, and their brief sojourn is forgotten, another wrinkle in the machinations of the ARQ. Elliott makes good use of his limited resources and keeps things moving intelligently and with a good deal of visual flair, despite the gloomy, and sometimes oppressive, atmosphere. The ARQ itself is nothing more than a revolving drum, and doesn’t always carry the weight of being such an important component of the story. Elsewhere, Elliott’s decision to make one of the intruders into an all-out bad guy adds unease to the narrative, and allows the story to go off in some unexpected directions. It’s this willingness to change the storyline and take chances with the material and the characters that is, ultimately, the movie’s biggest strength. And if these chances don’t always pay off, it’s a small price to pay for a largely solid and deliberately unprepossessing movie that tries hard to be different – and largely succeeds. 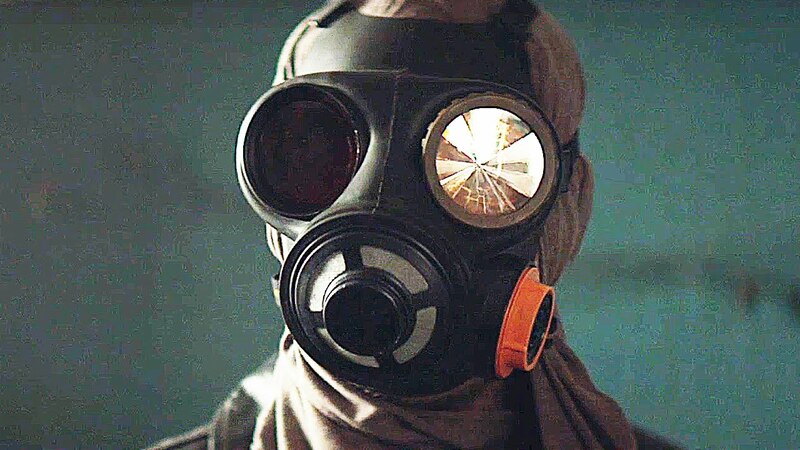 Rating: 7/10 – some viewers may be put off by the familiarity of some of the twists and turns thrown up by the time loop, but ARQ isn’t afraid to mix expectations and surprises, and it often manages to transcend both; a small-scale triumph then – not without flaws though – and a movie that has been carefully thought through from the off, it’s been assembled with a fair degree of skill and precision.